We go from the resplendent Polyphemus to a moth that looks like a piece of bird doodie. But in the world of moths, few cryptic designs are as admirable as those which resemble something a predator already ate. The schlaegeris are in a family of moths known as the Oecophoridae. Note the upturned sensory organs (labial palps) extending past the "forehead". While this is the one I come across most often, there is another nearly identical Antaeotricha known as A. leucillana. The latter is about a third smaller. Also, notice the dark tuft on the thorax. 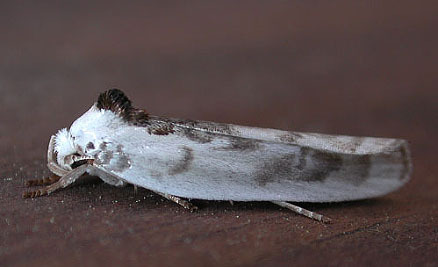 In leucillana it is usually a paler brown.